After our wonderful evening at L’Ardoise, we (and by we, I mean me) declared Friday night our official Friday night date night. But really it should be called our Friday night eat night since it’s really an excuse for us to eat out after a whole week of home cooking. One of the things that the hubs and I love to do is eat. We appreciate all kinds of foods and are always looking up new restaurants or cuisines to try, whether it be a michelin-starred or a hole-in-the-wall restaurant. And since we’re new to the city, what better way to get to know it than to try a new restaurant every week? 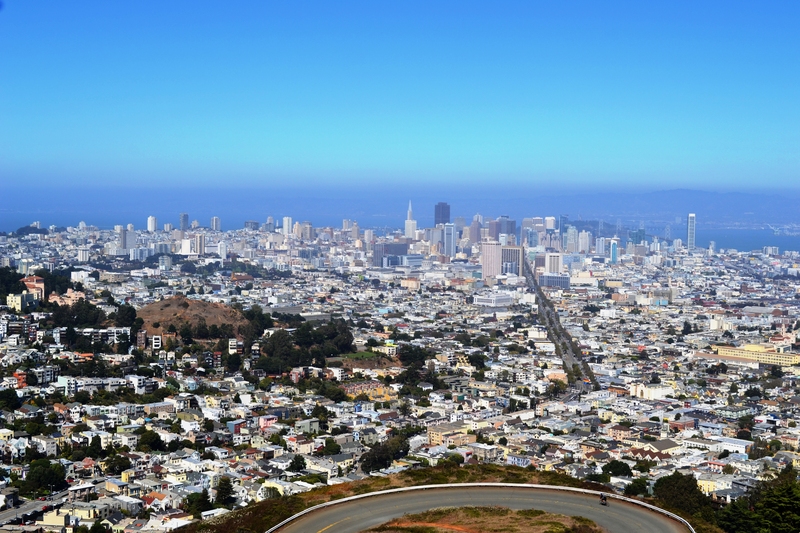 It will also give us a chance to venture out into different neighborhoods and experience the diversity that makes San Francisco special. Despite living in the city for approx. 2 months, the hubs and I had still yet to explore neighborhoods that are more than 2 miles away from us! I had heard great things about Dosa and when I saw that it was located in the Fillmore area of Pacific Heights, I thought it would make a good date night restaurant. Dosa’s Paper Masala Dosa was listed in the 7×7 100 things to try in SF before you die and of course I was keen to try it. If you guys haven’t heard of the list before, you should definitely check it out! I’ve only tried about 10 dishes from that list, but so far every one of them have been mouthwatering good. Anyway, back to Dosa. The hubs partook in their seasonal 3 course tasting menu for $35. He selected the Grilled Calamari, the Paneer and Peas Dosa, and the South Indian Lamb Kofta, all of which were tasty. I of course tried the Paper Masala Dosa and loved it. 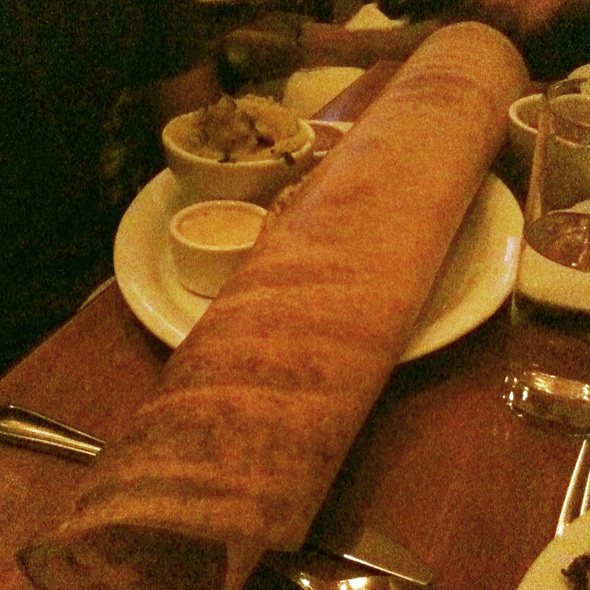 It also helped that the dosa was about 2 feet long! Look at that thing! I’m so glad the waitress warned me since I was about to order 2 dishes! I’ve had dosas before but they were usually too light and airy, but this one had a wonderful denser texture, it reminded me of my mom’s thin chinese style pancakes…drool. It came with several dips that were very flavorful and complemented the dosa very well. All in all I would highly recommend Dosa for a date night. 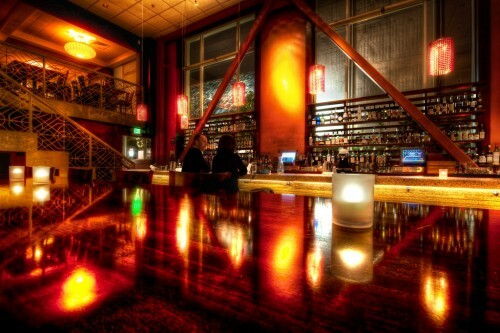 It is a larger restaurant and a bit noisy so I wouldn’t recommend it for an intimate or romantic evening, but the ambiance and bar scene is very hip/cool. Also the drinks menu was quite extensive and I liked that they had interesting cocktails. We strolled along Fillmore afterwards looking for dessert and ended up at Fraiche Yogurt. 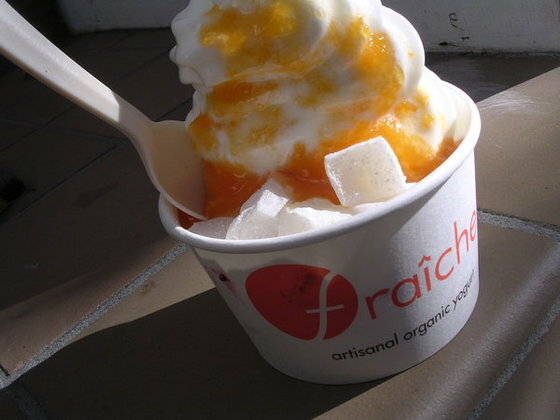 I’m a big fan of Pinkberry and Yogurtland so I was super bummed to find out that there aren’t any in San Francisco :(, but Fraiche will definitely be a good substitute. Similar to Pinkberry, there’s limited flavors but the flavors they do have are tends towards tart, which I love. But what really made Fraiche outstanding was their homemade mochi topping. I’m telling you, I can never go back to regular mochi now that I know what the fresh, homemade ones taste like! Truly a successful food night! 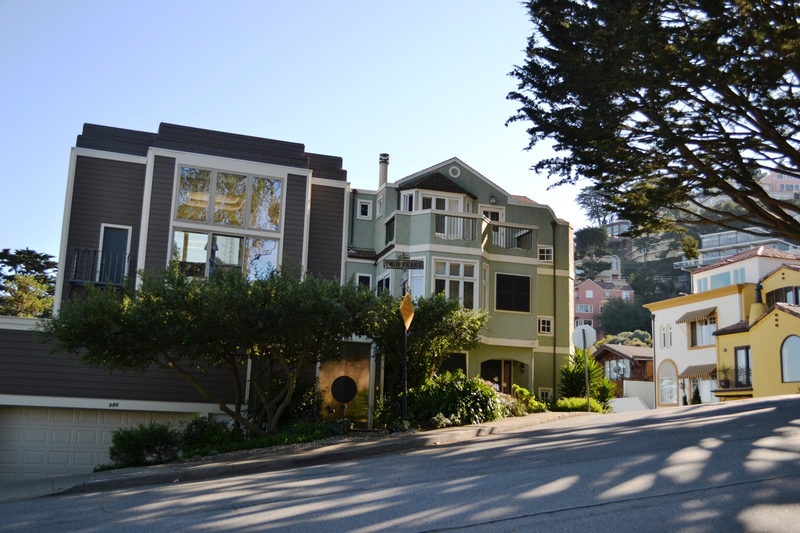 I will definitely be heading back to Fillmore Street again, but maybe during the daytime. It’s lively, full of boutiques and restaurants, and I can’t think of a better way to end a shopping trip than a stop at Fraiche. Where: Fillmore St. between Post & Clay St.